"3andC" is tic-tac-toe game with no even. In general tic-tac-toe is played even when the skillful players do. I wanted to make most simple tic-tac-toe as abstract strategy game for a long time. I have had good idea in 2006. 3andC board was arranged not to happen even to add calculation system. 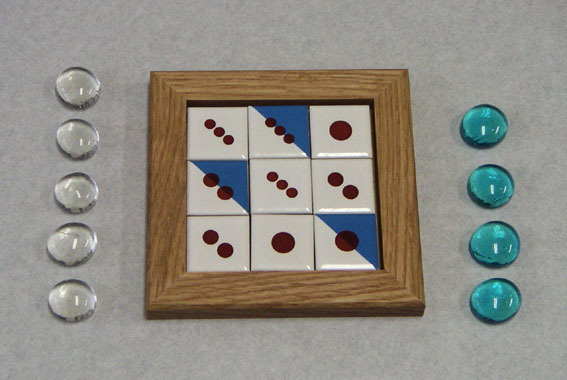 Tiles on the board are numbered 1 2 3 and three of them are colored in blue. When both players can't make 3 pieces in a row, player who gets bigger sum number of tiles where own pieces on will win. And when sums are same, player who gets more blue tiles will win. Tiles aren't fixed, so you shuffle them and make a different board pattern in every play. You can enjoy interesting play every times with no even! more information in Japanese about 3andC. click here! Object: To make 3 pieces in arow. 3 by 3 tiles board. 3 of them are printed 1 dot. 3 of them are printed 2 dots. 3 of them are printed 3 dots. and every 1 of them are blue coloed tiles. first player has 4 blue pieces, second player has 5 clear pieces. 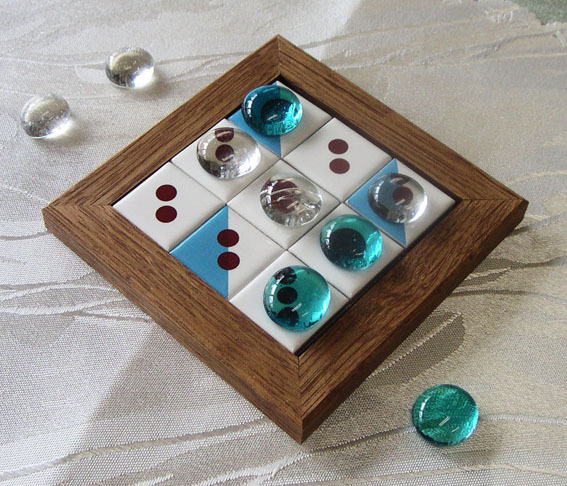 Shuffle tiles at random and make board before play. 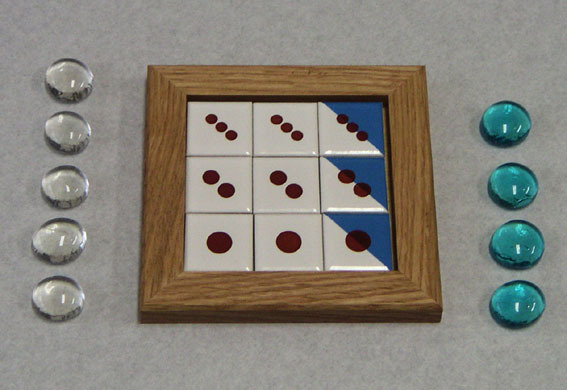 Both players place one of own pieces on the board by turn. Second player places own piece at last 8th turn and 9th turn continuously. Second player can place more pieces than first player. Player who makes 3 pieces in a row wins. When both players can't make 3 pieces in a row, player who gets higher score of tile dots where own pieces on win. And when scores are same, player who oqupied more blue tiles win. We can bring our games to game fans by international mail order!